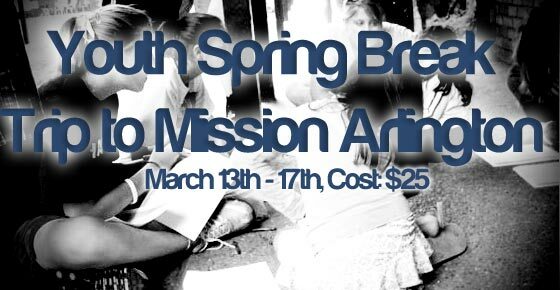 This spring break, our students are going to be ministering to the people of Arlington, TX through Mission Arlington. We will leave Sunday the 13th (at 2:00) and will return home Thursday the 17th (around 5:00 PM). WHO CAN PARTICIPATE? : Any students connected to this ministry, involved in a small group, and committed to attending the training meetings that will be held every Sunday night at 6 PM. WHERE DO WE STAY? : Housing will be in local guest housing that is dormitory style. Each room has a bathroom and showers. We will be eating breakfast and most dinners at this facility. What is the COST? : Individuals: $25 Price includes visa, lodging, food, bottled water, games, and a special lunch Thursday on our way home. Fill out the registration form online and turn in your $25 fee (if not already paid). Make sure you have your medical release form on file. The form used for D-Now will cover all of 2011. We will have a pre-trip meeting on Feb. 27th for all interested students and their parents. REGISTRATION FORM…PLEASE FILL THIS OUT IF YOU ARE PLANNING ON GOING WITH US. If you haven’t filled one out this year, you’ll also need this 2011 Medical Release form.